Build Your Immune System with Complex Of Graviola Natural Cancer Fighter & Immune Boosters! 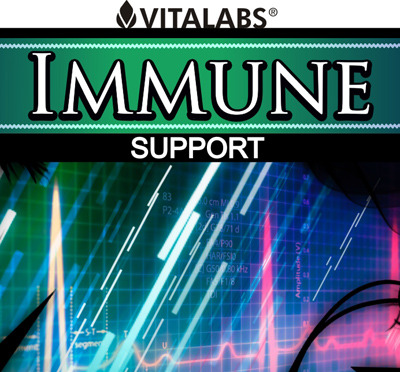 IMMUNE SUPPORT by Vita Labs contains Graviola, Beta-Glucan, Pine Bark, Red Raspberry and More. 120 Capsules. For much of the last hundred years science has been searching for a cure for cancer, arthritis,flu and even the common cold. Most of the research has been focused on finding a "magic bullet" in the form of an antibiotic, anti-inflammatory or vaccine. All the while, inside our own body lies the most powerful cure for what ails us, our immune system. The immune system is a person's primary defense against disease. "IMMUNE SUPPORT" is a powerful Immune Booster containing the powerful extracts of Graviola,Beta-Glucain,Pine Bark, Red Raspberry and more that promote positive health and maintain optimum body resistance. These foods make you 'full' and 'temporarily satisfied' but they fall well short on providing the fuel to keep your immune system strong. Even worse many of the processed modern foods contain known carcinogens and are no doubt a factor in the escalation of cancer in the last few decades. According to The Federal Interagency Forum on Aging-Related Statistics report entitled "Older Americans 2000: Key indicators of Well Being". The incidence of cancer increased by 8% between 1984 and 1996! Unless you live in the country, free of all air pollution, grow all your own organic vegetables and fruit, plus rear your own free range chickens and grass fed beef on land that is uncontaminated with pesticides then you really need to give your immune system a serious 'helping hand'. Fortunately science has discovered quite recently the beneficial immune enhancing properties of various natural ingredients contained in "IMMUNE SUPPORT". Support your immune system Cutting edge medicine has shifted from treatment to prevention. The first things you should do are: 1. Eat a healthy diet. 2. Exercise regularly. 3. Keep stress levels to a minimum and get plenty of rest. 4. Take a nutritional supplement with ingredients that provide immune support for adults. " IMMUNE SUPPORT " supports the essential building blocks of your body's immune system at the cellular level.